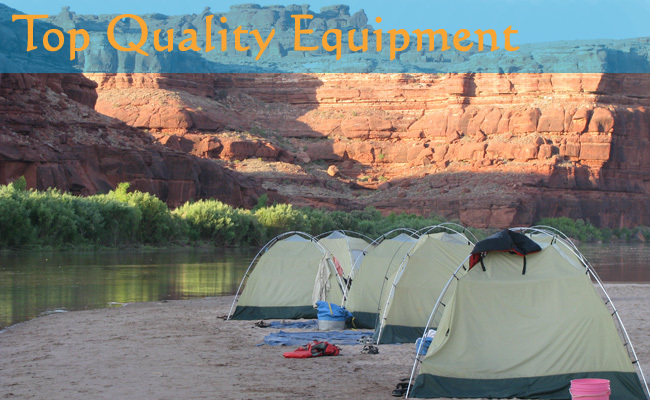 Discover the quality of equipment that is offered only on a Sheri Griffith Expeditions trip. Our equipment is top of the line, state of the art and in good repair. 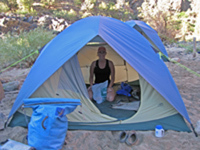 Cozy, clean sleeping bags; River rafting specific sleeping pads; Clean, roomy and easy to setup tents are all provided for you: free of charge. We provide comfortable chairs, umbrellas, horseshoes, and camp games for entertainment and relaxing. These are inflatable rafts (approx. 17 – 18 feet in length) the guides maneuver them with a set of oars secured to a frame in the middle of the raft. This is considered to be a more stable craft than a paddleboat. These are inflatable rafts (approx. 15 – 16 feet in length) manned by guests and their paddles. The guide gives instruction and navigates from the back of the boat. 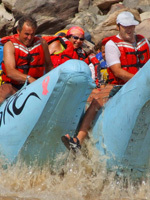 These inflatable rafts (23 feet in length) are motorized and move faster down river. 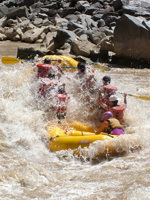 The guide operates the motor from the rear of the raft. They are much larger than the other rafts and are considered to be the most stable. 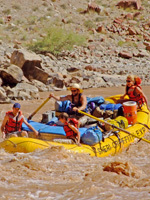 These rafts are used on the Cataract Canyon 2, 3 and 4 day trips only. These small inflatable rafts are manned by 1 or 2 guests with their double-ended paddles. There are no guides in these crafts. The IK’s are a great way to get up close and personal with the whitewater. They are available to rent for most of our trips. 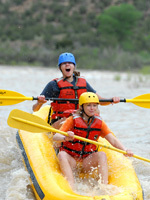 IK’s are provide for the group on the Green River, and Yampa River trips. These hard-hulled boats have a keel and rudder, are manned by 1 or 2 guests with their double-bladed paddles and are easily maneuverable in moving water. (Not for whitewater use.) There are no guides in these crafts, so it is up to the guest to maneuver the boat. 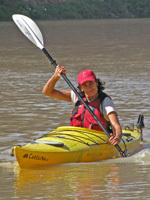 Kayakers follow instructions from guides in nearby kayaks or rafts. Roomy tents that are easy to set up. Freshly laundered sleeping bags provide warmth on cool evenings. Large sleeping pad for comfortable sleeping at night. Water-resistant bags help keep your personal items out of the sand and water. A personal day-use bag keeps important items handy during the day. Larger Camp chairs offer comfortable seating while in camp.